If you know me at all, it’s no secret that I LOVE to entertain! 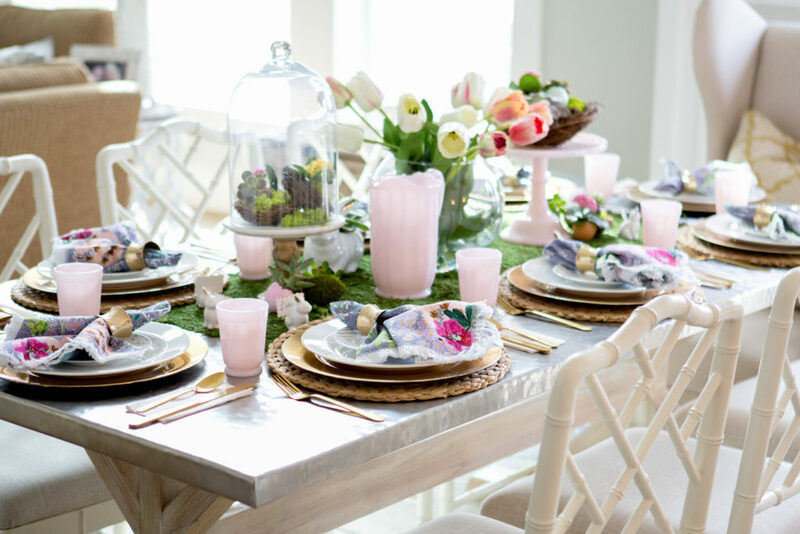 Easter is no exception and one of my favorite holidays to decorate, I love all the fresh spring florals and subdued colors. 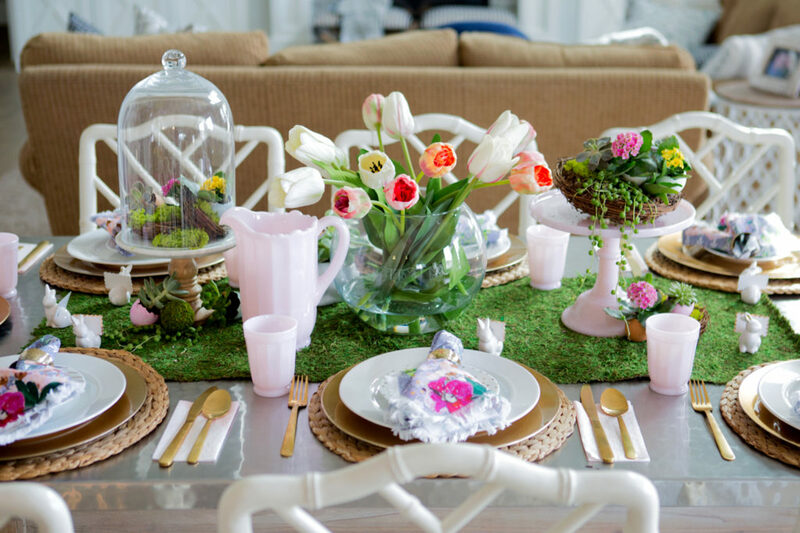 We all had a blast putting together this amazing Easter table scape. 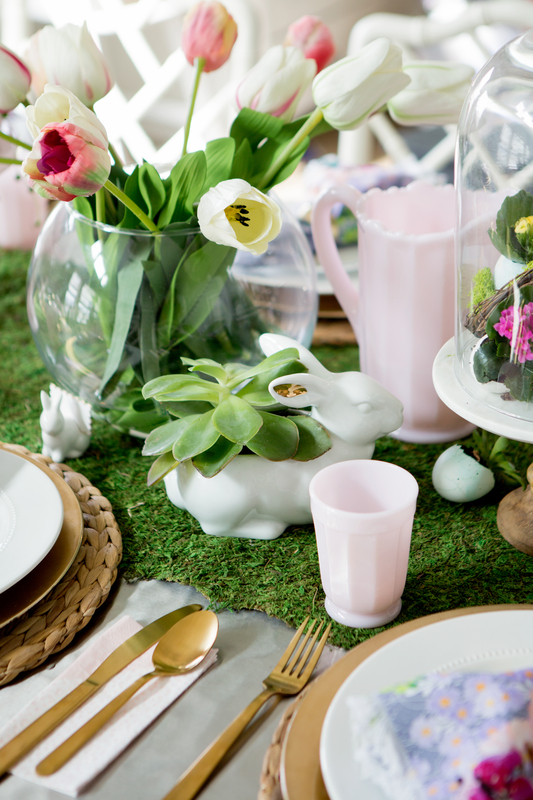 I love the way all the organic elements and bright colors came together to create a beautiful spring dining table that everyone will enjoy eating at. 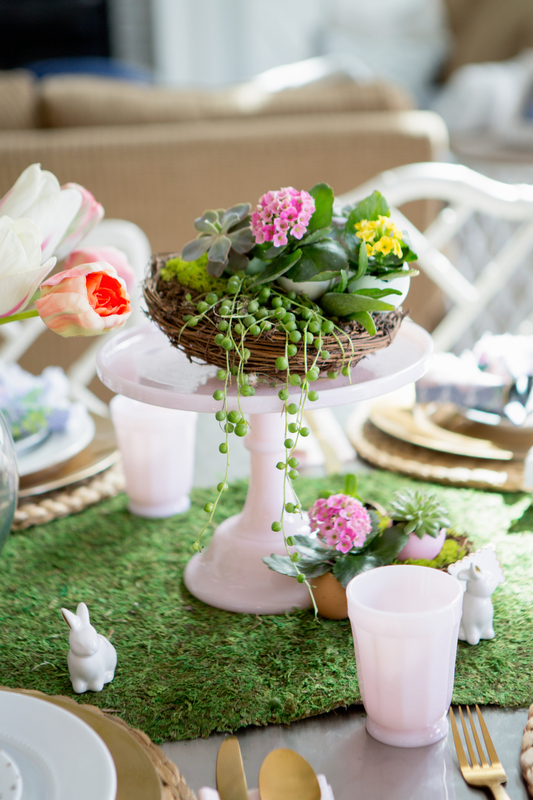 We used the Easter nests that we made in our previous Easter nest craft post (click here to see post) as the inspiration for the table. For the base of the table we used a moss table runner that we got locally at Michaels craft store. For the center pieces we used a couple of cake stands to hold the nests and create height. The pink cake stand is one of my favorite pieces, the nest went perfectly on it. 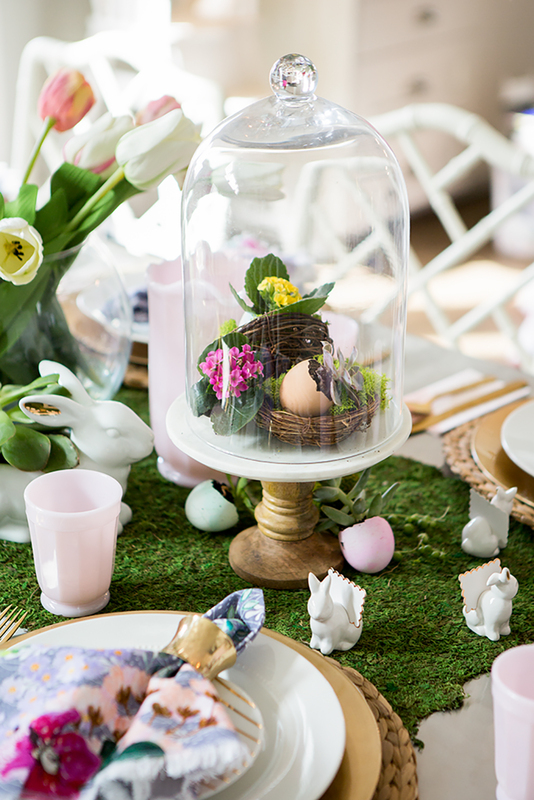 We used the covered glass stand for some of the smaller nests and succulent eggs. The center floral arrangement was super easy, it is just a clear vase that we put some faux tulips in (you would never know). Really you could use any type of spring floral arrangement, fake or real, we love using tulips for Easter. For the table setting we started with a natural braided place setting and added a gold charger for a bit of glam. We topped it with a plain white dinner plate and a white and gold patterned salad plate. A little tip when doing a table setting is to use different layers and textures to create a more dramatic look. 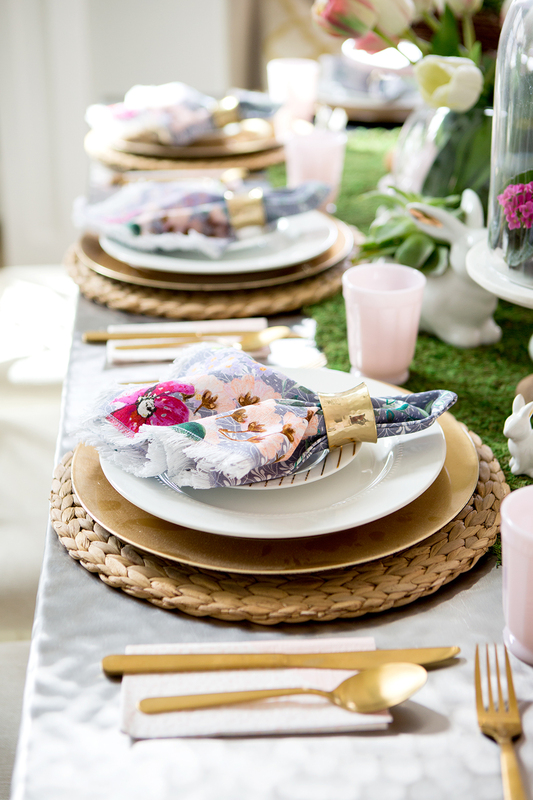 We finished it off with the beautiful floral printed napkins and pink glasses that tied everything together. I truly wanted to keep this up until Easter and I would have if my two year old wasn’t SO destructive! I can’t wait to have a dinner party with a few family and friends, we had a blast putting it together and hope you gained some inspiration! Find some of the items we used to create this table scape here. Your tablescape is gorgeous and I’m so bummed those napkins are sold out! Happy Easter! Thank you so much! If I find any similar ones I will be sure to let you know! Happy Easter!